I love the feeling of going to the grocery store with not a clue what to get: Stomach rumblin’, mind a tumblin’. Fortunately, most grocery stores are designed in the same way, and I have to give Lord Henry von Supermarket the kudos for smart design. 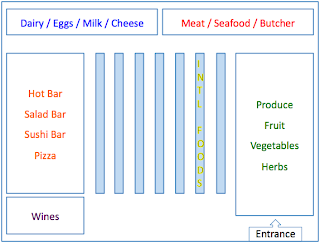 Most grocery stores will have the produce section first. For someone with no idea what to make for dinner, I think this is ideal. It gives off the nice colors and smells and aura of freshness that get the mind thinking of some good combinations: potatoes and corn, tomato and basil, squash and pepper, onion and garlic, are some traditional ones. But then I usually take that all in and move right to the butcher. Meat is the simplest way to begin designing a dish. I like to think of flavors and meats, marinades and spices. If I’m not in a hurry, I’ll take a gander around the hot food and international food sections to gather up some more flavorful ideas as well. Then back to the butcher. 1. Make a spice rub for the pork. I used cajun blackening spice, fresh ground coarse black pepper, salt, rosemary, thyme, savory spice mix, and a bit more garlic powder. They say not to over-spice your meat? I disagree with that one. The only rules in cooking is to eat or share all that you make and to make sure the kitchen is clean before and after cooking. 2. Rub the spice into the pork, on both sides and edges too. 3. Chunk up the raw yams and boil. You’ll lose some sugars by boiling but you can always add it back in! When potatoes are cooked, drain the hot water, add a big chunk of butter, some brown sugar, and mix. Keep the skin in there, it’s the best part. 4. Chop the squash and cook in a frying pan in butter on med to med-high heat. You’ll get some good brown edges which have the best flavor. 5. Cook the pork. There should be some leftover butter in the pan after removing the squash, but if not, add some butter or a little bit of olive oil and heat it up. Toss the pork in and cook a few minutes on med-high heat. Flip and cook until middle is barely pink / white. 6. 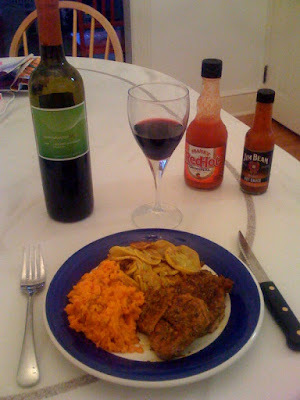 Frank’s Red Hot sauce is perfect for this and/or throw some applesauce on your plate too. I served with a random on-sale cabernet sauvignon called Pepperwood Grove (2006, California). Don’t listen to wine rules, just get what you want. If you don’t want wine, 2% milk hits the spot. Main advice here is you don’t always have to pre-plan. Try the walk-in approach and let your senses guide you to dinner preparation. Then you won’t be a rumblin’ no more.